Jack Tottle, in liner notes to “Don Reno & Red Smiley on Stage,” Copper Creek Records, 1996. Red Smiley came to prominence during an era when bluegrass music was a subset of country music. His records played on country jukeboxes and country radio. He appeared on bills with major country stars and hosted them as guests on his television show. His performing years stretched from the brother duets and string bands of the thirties to the honky tonk shuffles of the fifties, sixties, and early seventies. He and his fans both enjoyed mainstream country music, and it was a staple of his repertoire. 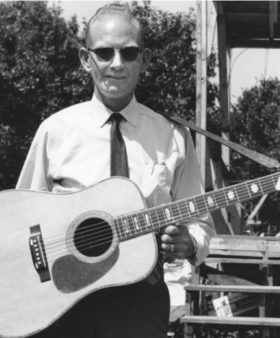 Although Red was one of the few early bluegrass stars who didn’t apprentice with Bill Monroe, he performed almost entirely with acoustic instruments and within the bluegrass idiom. A mild-mannered gentleman, Red Smiley was beloved by audiences and fellow artists alike, throughout his all-too-short career. Born Arthur Lee Smiley in mountainous western North Carolina, his red hair suggested the nickname “Red.” His father, a school administrator, teacher, and fiddler, was a friend of mountain music scholar and performer Bascom Lamar Lunsford. According to Barry Willis in “America’s Music: Bluegrass,” Red was inspired by two hobos playing in Bushville, North Carolina, when he was about seven. 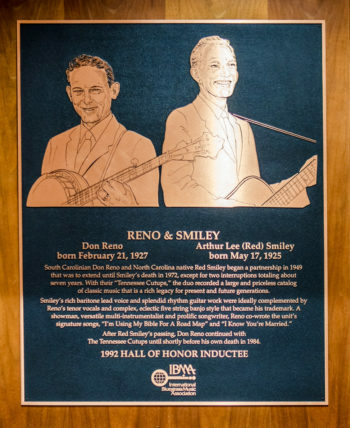 As a teenager, he played guitar and sang with Bryson City, North Carolina residents Harry and Harley “Smoky” Tallent and Lewis Sherrill as Smoky and the Carolina Ramblers. By the late 1930s, he was playing on WROL in Knoxville. Smiley joined the Army in 1943. After discharge, he attended diesel mechanic school in Nashville, Tennessee, where he first saw Don Reno on stage at the Grand Ole Opry with Bill Monroe, but didn’t meet him. He also performed in east Tennessee and western North Carolina with well-known musicians Zeke Morris, Red Rector, Fred Smith, and the Sauceman Brothers. In 1949, Red joined fiddler Tommy Magness’s band at WDBJ radio in Roanoke, Virginia. Hearing that Don Reno had left the Blue Grass Boys, he convinced Magness to call and offer him a job. Don accepted and came to Roanoke, where he and Red first met. Soon after, they recorded four Reno-penned sacred songs for Federal, a subsidiary of the King label in Cincinnati, Ohio. Although their personalities and styles were very different, Red and Don realized that the combination was magical. After Tommy Magness retired, both joined Toby Stroud’s Blue Mountain Boys in Wheeling, West Virginia for a short stint. King Records’ Syd Nathan called, offering to record Reno and Smiley alone. In 1952 the pair went to Cincinnati and recorded a session, which included “I’m Using My Bible for a Roadmap.” Red subsequently went back to Asheville and worked as a mechanic with the State Roads Commission, playing some with Bill Monroe alumnus Wilbur Wesbrooks. Don went back with Arthur “Guitar Boogie” Smith and the Crackerjacks in Charlotte, North Carolina. The King records began to sell and more sessions were held, in 1953 and 1954. A man in Richmond badly wanted to produce a live show with Red and Don, so during the Easter weekend of 1955 they got the bass player and fiddler from the last session out of their South Carolina cotton mills and went to Richmond. It was at this time that Red Smiley, Don Reno, John Palmer, and Mack Magaha first played together on a stage. The Saturday night before their stage show the group played the Dominion Barn Dance, a radio show held in Richmond. After that appearance, the Barn Dance offered them a regular job at eighty dollars a show. They accepted and Don Reno, Red Smiley and the Tennessee Cut-Ups were born. In December they took on Carlton Haney as a manager and went on to break box office records wherever they appeared – releasing a single record every six weeks. They started the first early morning country music TV show in Roanoke, Virginia, on December 31, 1956. “Top O’ the Morning” appeared every weekday until 1968, and was soon followed by a Saturday night radio barn dance in Danville and a weekly TV show in Harrisonburg. Touring was restricted by the heavy TV schedule, and by Red Smiley’s health. The war injuries and diabetes sapped Red’s strength, and he lost almost 100 pounds in the decade following 1955. An amicable parting of the ways occurred in 1964, shortly after fiddler Mack Magaha left to join Porter Wagoner in Nashville. Don took the band name and his mandolin-playing son Ronnie. Red kept bass man John Palmer, the bus, and the Roanoke TV show. Smiley recruited fine musicians for his Bluegrass Cut-Ups. They worked on the WWVA Jamboree in Wheeling, West Virginia, and recorded five albums for Rimrock and Rural Rhythm, most of them since reissued on CD. When “Top O’ the Morning” was cancelled in 1968, Red retired and the band continued as the Shenandoah Cut-Ups. That year, Smiley recorded 10 sides for Major with electric country backing. Although they sounded good, and “Best Female Actress of the Year” got some airplay, a country career was not in the cards for Red. Introduced to bluegrass a smoother, lower-pitched vocal style, influenced by mainstream country music of the time. Co-led one of the earliest and most entertaining bluegrass acts in history. A pioneer in bringing bluegrass to television, performing more than 3,000 weekday broadcasts over the years 1956-1968. Aspired to a solo country music career, which he pursued briefly in Ohio before teaming with Don Reno in Tommy Magness’s band, and again in 1968 after retiring from a daily television program in Roanoke, Virginia. Played guitar on the first major-label bluegrass album by a female, “Rose Maddox Sings Bluegrass,” 1962. Wore a dress made by Mack Magaha’s mother and a wig bought in New York City as “Pansy Hot Rod” in the Tennessee Cut-Ups comedy routine, making him the first bluegrass cross-dresser. Owned a restored Model A Ford, with which he was pictured on an album cover and in the opening sequence to Reno and Smiley’s earliest television shows in Roanoke. Jack Tottle in liner notes to “Don Reno & Red Smiley on Stage,” Copper Creek Records, 1996. Eddie Stubbs in liner notes to “Don Reno & Red Smiley on the Air,” Copper Creek Records, 1996. Red Smiley, 1971, quoted by Colin Escott in the liner notes to “The Best of Red Smiley,” Rural Rhythm Records, 2006.